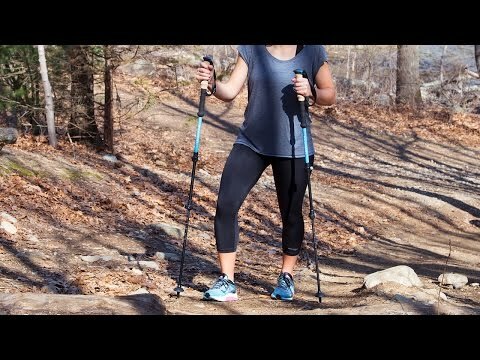 This set of strong trekking poles can make any outdoor excursion—from walks and hikes to backpacking and snowshoeing treks—more enjoyable. The adjustable aluminum poles have comfortable EVA foam grips and carbide spike tips for stability. They lend support on snowy or rocky terrain, or even pavement. And the lightweight, collapsible design makes it easy to take a pair along with you. Dimensions: 1.5" x 1.5" x 24"- 53"
When the folks at Montem were on the hunt for strong trekking poles—and didn’t like what they found—they made their own. Their Ultra Strong poles are suited for all types of trekking, from wintery walks to backpacking and snowshoeing. They’re adjustable and durable, so they feel good while lending support. And the lightweight, collapsible design is perfect to take along on camping or backpacking trips. Soft but structured EVA foam grips are comfortable to hold, and the material is sweat-wicking, anti-microbial, and odor-resistant, too. Carbide spikes can be topped with rubber tips to take you from the snow or rocky terrain to pavement, and a horizontal flick-lock system is easy to adjust. If you hear the outdoors calling you, grab these poles to help you enjoy your time even more.